New Method to Activate iphone with carrier 3g/4G ios 8.4 and Taig jailbreak, this is a ios8.4 bug alter jailbreak. all information and developer comes from UnJailMe ( youtube channel ) helping a lot to remove icloud from all devices. Also this could be good news for those have hacktivate iphone 4, bypass with minacriss or doulci tool and do not have network signal from sim card. Activate any IOS idevice compatible with r-sim 10. No matter who your carrier is your last step will be CDMA option to get in the springboard + activation ticket to jailbreak! choose carrier get in springboard after correct imsi info but dont forget choose last option (cdma) and remove sim+ r-sim if not ( you will be in an endless upgrade/activation loop). After jailbreak with current taig upgrade essentials and install openssh find your IP , use winscp, (your iphone ip) port 22 scp user:root pass:alpine backup and delete setup.app . Reboot and then add correct GSM imsi etc from rsim10. This will remove ANY icloud that is added AFTER jailbreak!!! Full FMI removal and full 3g/4g/lLTE. – NEW ICLOUD MUST BE ADDED AFTER JAILBREAK TO WORK!!!! after restore the iphone is new!!! but r-sim last option will give activation ticket for springboard and jailbreak. 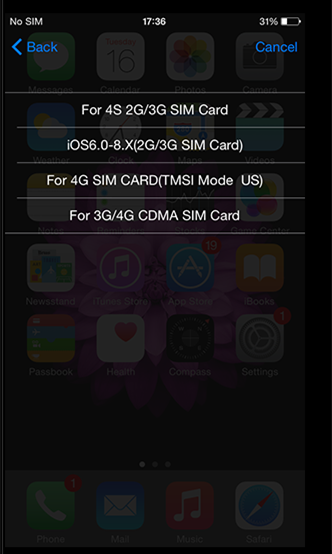 no matter the gsm carrier or country choose cdma as last step, u get activation ticket and jailbreak.